"The retired Air Force General who headed the Military Airlift Command and served as Superintendent of the Air Force Academy in the 1970s, died August 11, 1992 of cancer in a hospital at Andrews Air Force Base, Maryland. He was 66 and lived in Alexandria, Virginia. A native of Louisville, Kentucky, he was a 1948 graduate of West Point. He flew in combat missions in both the Korean and Vietnam Wars. After the Korean War, he held posts in the U.S. and Germany and then returned to West Point as a faculty member. In Vietnam he flew F-4Cs as Deputy Commander for Operations at the 12th Tactical Fighter Wing at Cam Rahn Bay. Returning to the U.S. in 1966, he became Deputy Commander For Operations at the Pilot Training Wing at Craig Air Force Base, Alabama, held planning positions at the Pentagon and then commanded the 19th Air Division at Cardwell Air Force Base, Texas. In the Pentagon post, he was the principal architect of the joint Army-Air Force helicopter raid in 1970 on a camp in North Vietnam where U.S. prisoners of war were believed to be held. No prisoners were found at the location. 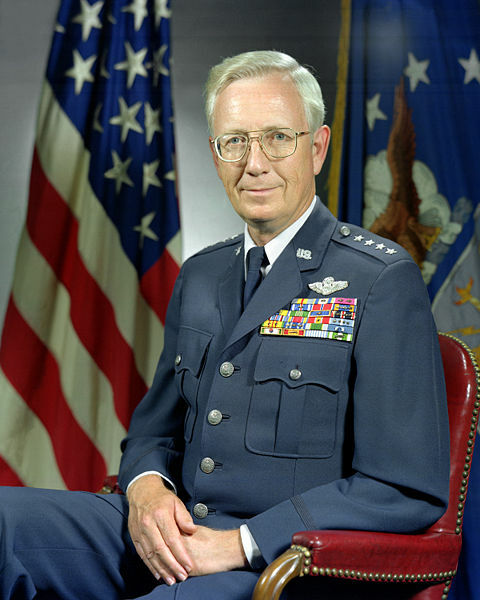 In 1973, he was named Chief of Staff of the Strategic Air Command and the following year took the job of supervising the Air Force Academy in Colorado Springs, Colorado. Three years later he was promoted to General and appointed Chief of Staff at the Headquarters of the North Atlantic Treaty Organizatin (NATO) in Brussels, Belgium. He was Deputy Commander of the U.S. European Command from 1979 to 1981 and led the Military Airlift Command at Scott Air Force Base, Illinois, until his retirement in 1983. He was survived by his wife of 40 years, Kathryn A. Allen. 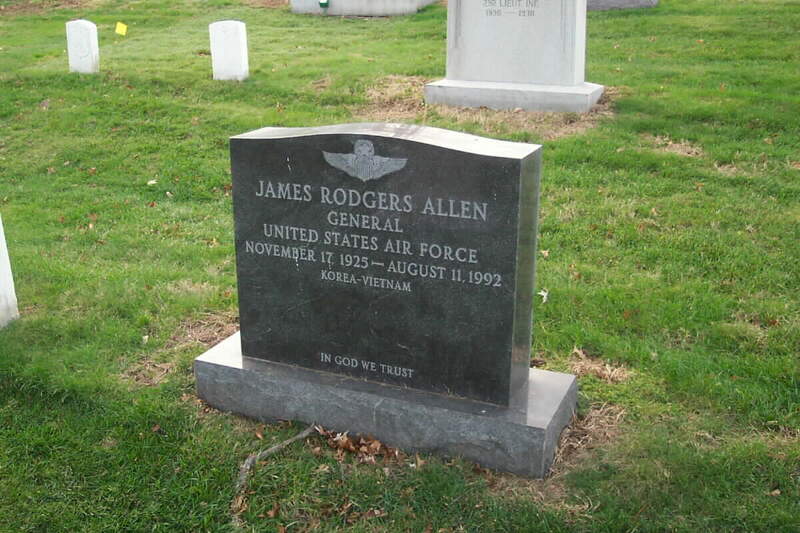 He was buried on August 17, 1992 in Section 6 of Arlington National Cemetery. General James R. Allen is commander in chief of the Military Airlift Command, with headquarters at Scott Air Force Base, Illinois. He is responsible to the president and the secretary of Defense through the Joint Chiefs of Staff for the planning and performance of airlift missions during wartime, periods of crisis and peacetime exercises. The general directs the management of all strategic and tactical airlift forces worldwide to ensure operational support to unified and specified commands engaged in military operations. During routine peacetime conditions, airlift service is provided by the Military Airlift Command commander, through the secretary of the Air Force, in his role as executive director of the Single Manager Operating Agency for Department of Defense Airlift Service. In this capacity, he is also responsible for air rescue, air weather, aeromedical evacuation, and combat documentation and audiovisual systems throughout the world. General Allen was born in Louisville, Kentucky, in 1925, and graduated from Louisville Male High School in 1943. He entered the U.S. Military Academy, West Point, N.Y., in 1944, graduated in 1948 with a bachelor of science degree in military engineering and was commissioned a second lieutenant in the U.S. Air Force. In 1965 he received a master of science degree in business administration from The George Washington University, Washington, D.C. He was presented an honorary doctor of laws degree by the University of Denver in 1975. General Allen graduated from the Army Command and General Staff College, Fort Leavenworth, Kansas, in 1960 and the Industrial College of the Armed Forces, Fort Lesley J. McNair, Washington, D.C., in 1965. After graduation from West Point, he attended flying training at Randolph Air Force Base, Texas, and in September 1949 received his pilot wings at Nellis Air Force Base, Nevada. General Allen served with the 18th Fighter Group from September 1949 to June 1951 in the Philippines and South Korea where he flew P-51s and F-80C's. During the first two months of the Korean War, he flew combat missions as a member of a volunteer squadron with the South Korean air force. From June to October 1951, he served as aide to the commander of 5th Air Force. He returned to the United States in October 1951 to fly F-86A's as a member of the 71st Fighter-Interceptor Squadron at Greater Pittsburgh Airport, Pennsylvania. In June 1953 he was assigned to the U.S. Military Academy where he served as company tactical officer. His first assignment to Europe was from December 1956 to July 1959 at Ramstein Air Base, Germany. While there he was a flight commander, operations officer and later executive officer to the director of plans, Headquarters United States Air Forces in Europe. He returned to the United States in 1959 to attend the Army Command and General Staff College and was assigned the following year to the Directorate of Plans, Headquarters U.S. Air Force, Washington, D.C. In August 1964 he entered the Industrial College of the Armed Forces. In July 1965 General Allen transferred to Eglin Air Force Base, Florida, where he activated and commanded the 4th Tactical Fighter Squadron. After a brief period in this assignment, he went to Cam Ranh Bay Air Base, Republic of Vietnam, flying F-4C's and as deputy commander for operations of the 12th Tactical Fighter Wing. In December 1966 he became the deputy commander for operations of the 3615th Pilot Training Wing at Craig Air Force Base, Alabama. The general returned to Air Force headquarters in August 1968 as assistant deputy director for plans and in August 1969 became deputy director for plans and policy in the Office of the Deputy Chief of Staff, Plans and Operations. In January 1972 he took command of the 19th Air Division at Carswell Air Force Base, Texas. In August 1972 General Allen became assistant deputy chief of staff for operations, Strategic Air Command, with headquarters at Offutt Air Force Base, Nebraska, moving up to deputy chief of staff for operations six months later. He became chief of staff for SAC headquarters in September 1973. He returned to Headquarters U.S. Air Force in January 1974 as special assistant to the Air Force chief of staff. From August 1974 to July 1977, he was superintendent of the U.S. Air Force Academy, Colorado. He then was named chief of staff, Supreme Headquarters Allied Powers Europe, Belgium, and in July 1979 the general became deputy commander in chief of the United States European Command. He assumed his present command in June 1981. He is a command pilot and has flown AT-6s, P-51s, F-80C's, F-86A's, F-lOOC's, F-4C's, T-37s, T-38s, B-52s and KC-135s. His military decorations and awards include the Defense Distinguished Service Medal, Distinguished Service Medal with oak leaf cluster, Legion of Merit with two oak leaf clusters, Distinguished Flying Cross with oak leaf cluster, Bronze Star Medal, Air Medal with 11 oak leaf clusters, Air Force Commendation Medal with oak leaf cluster, Army Commendation Medal, Air Force Outstanding Unit Award ribbon with "V" device and three oak leaf clusters and Republic of Korea Presidential Unit Citation. In February 1979 the government of France awarded General Allen the French National Order of Merit in the rank of commander. He received the Order of the Two Niles from the government of Sudan in November 1980. He was promoted to general August 1, 1977, with same date of rank.